A few days back, I had blogged about doing my little bit for Sintel. During the entire week, I had been talking a lot with Zoyd on IRC, who had suggested the idea of getting Indian language subtitles done for the movie. He helped me get going and guided me through the entire process. These were perhaps the longest conversations I have ever had with him. At other times, it was just a daily ‘Hi’ between the near-bot nicks on #pluggies (on Freenode). Unfortunately, these were also the last. Yesterday, he passed away in a fatal road accident in Pune. We were not close friends, and crossed paths mostly during the conferences. Heck, I never could remember his real name (Vinay Pawar), beyond Zoyd. It was the close acquaintance of the past few days that heightened the sorrow of his passing away and completely shook me up when I heard the news. He had been working with Open Source animation tools and seemed to be enjoying it. A shame to lose a potential rockstar in the making. Probably, more than the person, I’ll surely miss the IRC nick that exchanged greetings with me everyday. I hope you find happiness wherever you are now, Zoyd. You’ll be missed here. This entry was posted in planetarium, Work & Technology and tagged friends, planetarium on October 10, 2010 by runa. Earlier on most weekends we used to end up either catching up on sleep or shopping for groceries or aimlessly roaming around Camp. These days I have found new things to keep me occupied, thanks to multiple newsletters that land up with event information around Pune. Last Saturday, after a disastrous morning show of ‘Raajneeti’ and a number of chores down, Shreyank and I got to spend a fun evening at a Drum Circle. Essentially, it is a gathering of people who sit around to form a circle and play percussion instruments. The one we attended is held every Saturday at the Rewachand Bhojwani Academy right next to Bishop’s School in Camp and is conducted by Mr.Peter Vieges. Both Shreyank and I had no idea about the location of the School, so we hired a rickshaw from around SGS Mall. Unfortunately, the rickshaw driver did not know the place either but he insisted that he would locate it for us. We passed it once, but later found it without much of a hassle. A few people were going in and we walked in too. Peter and a few others were setting the chairs and bringing out the drums. Everyone present seemed to know each other and we both were the newcomers. After some warm hellos we took our seats. Shreyank apparently had dabbled a bit with drums earlier, but I was a complete novice. I had no idea what I was supposed to do, but Peter told me to grab a drum and to join in nevertheless. Unfortunately, I forgot to ask the names of the instruments we played that day so for this post I’ll stick to ‘big drum’ and ‘small drum’. I got a ‘big drum’ for myself. The drum had a cord on its side and Peter showed us how to hold the drum between our legs and it had to face outside for a resonant sound. Me being vertically challenged nearly had it facing straight up. Next up, Peter showed us the basic hand movements and the beat to follow and we started playing. It wasn’t anything spectacular like one sees in starry concerts. But the sounds from a dozen drums started resonating to the beats. With smiles to match. Next up we tried some variations in the beats and also in the way we were playing. Half of us played one beat and the others played another. Peter stepped up and led us by tapping his feet to give us a cue about when to play the bass (open palms on the face of the drum) and the tone (finger tips on the edge of the face of the drum). Each time we started slow and then the beats picked up speed to create ecstatic music that echoed around. Shreyank and I were both playing the ‘big drum’ earlier. He was hitting the edge a lot and his fingers started hurting after a while. He exchanged his ‘big drum’ with a ‘small’ one and looked happier. We even played a round of ping pong (1 beat for the person on your right to play and 2 beats for the person on your left) with the drums. The evening ended in a crescendo with a rumble. Initially, we started with about 10 people, including children aged approximately between 4 to 14 years. A few more people joined in soon after. We had a round of introductions and turns out that like us nearly everyone had day-jobs (the grown-ups in this case) which had nothing to do with music. Some have been attending the circle for as long as a year. We played for nearly 90 minutes and a couple of other instruments were also brought out to accompany the percussions, including some lovely flute. The group was welcoming and at no point did Shreyank and I feel that we have intruded. Since I wanted a couple of pictures for my blog, everyone graciously smiled and sat down again with their drums for me to take photos. Phone numbers were exchanged and we helped in putting away the drums. Both of us are definitely going back. If you are in Pune, then do come and join the circle, which meets every Saturday at 7:00 PM at the Rewachand Bhojwani Academy near Bishop’s School in camp. 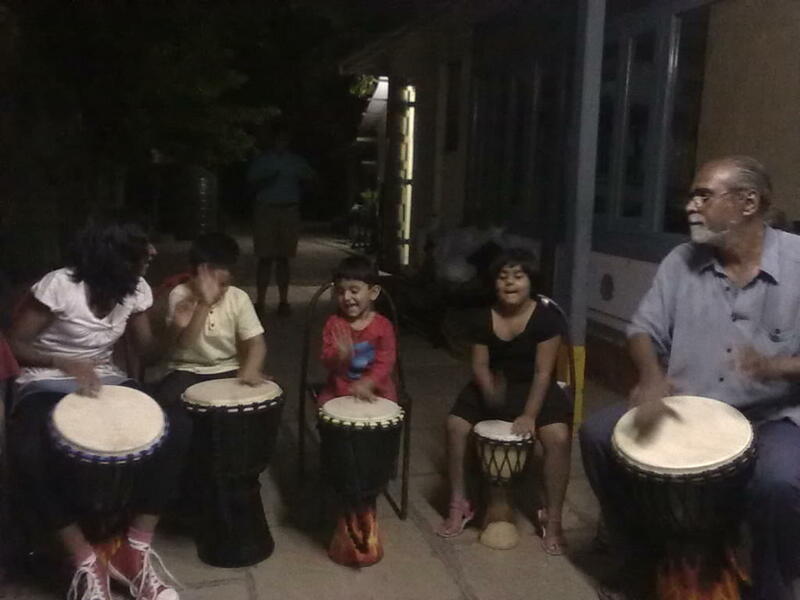 This entry was posted in Personal and tagged drumcircle, friends, me, music on June 8, 2010 by runa. Sometimes I double up as tech-support (from CDs not mounting to social networking crisis) for a few friends. The other day a friend could not figure out how she could set up her ‘hometown’ field in Facebook, since only the options in the drop down were being shown for selection. So I went ahead to simulate the bug and just when I was about to write mine I stopped short. I have been to many places over time and did not know what to write. 1. Shillong – I was born here and my first living memories are about this place. But I lived here with only my parents and the other members of the family lived in the family home at Guwahati. My aunts and uncles also maintained similar satellite units with motherships elsewhere. So technically, it did not qualify as the root of the chart. 2. Guwahati – This was the place with the massive family home. But I never ‘lived’ here as in living in the long term. Only during vacations and did not have any social associations whatsoever. 3. Kolkata – We moved here when I was 10 , restarted school and my growing up years were spent here. But since this was a place with which we did not have any historical connections at all, it was always considered a home-away-from-home in the back of my mind. 4. Pune – This is the coming-of-age city where I established a completely independent identity of my own. Although my family still lives in the house at Kolkata and I keep going back ‘home’ from time to time, but for reasons mentioned in Point #3, it is not ‘hometown’ either. Although Pune is the closest I can call as ‘home’ mostly because it is integral to my current identity, it still is not hometown because I moved in here from elsewhere. For various reasons I am attached to all these cities, in different degrees of affection which makes it even more difficult to make a choice. So what exactly is my hometown?? This entry was posted in Personal and tagged friends, me, random on June 1, 2010 by runa. This weekend saw our home transform into a campsite, with folks from various corners of Pune, Mumbai and France. A separate blog post would follow later, for the people who could not make it. As an aside, I had my own personal adventure of sorts on Saturday morning. I had to make a quick trip to the other side of town to run an errand. Mrugesh had brought along his Bullet from Mumbai and we decided to take a ride on it. I slung my bag and put on a red coloured helmet and was all set for the long ride. We took off and after about an uneventful 3 kilometers were approaching the crossing of Mundhwa, which recently turned into a full-fledged crossing from a T-junction. Yet another road is currently under construction and without any sort of Traffic signal or police monitoring, and street lights, it is going to be an adventure when this 5th road opens up. From this crossing, we had to take a right turn to move towards Kalyaninagar. Mrugesh spotted another bike rider making way from the left and started honking hard. The guy looked right, slowed down and just as we were about to cross him, inched forward a little more coming into our path. A collision was inevitable. I tried to move my body a little to the right, and turned my head away. Mrugesh had slowed down considerably by then, and I felt a small nudge on my left side, probably from the handle of the other bike. Thankfully, it did not pain, not then or later. We rode down another 50-60 meters and came to a halt. Both of us checked if either of us were hurt and after confirming that things were not serious enough we restarted our journey. We rode down for another 2 kilometers or so, until we reached the traffic signal near the Westin Hotel. I took off my helmet since it was getting hot and we had to wait for about a minute at that signal. Thats when I realised that my bag pack with a purse full of cash was missing! I started howling frantically. It seemed idiotic that it took me so long to feel that the bag was not present. We turned and rushed back to the spot, checking on the road as we rode. Back at the junction, I got off the bike and asked a few folks around. One person told me, that a bag matching the description had been picked up by a biker and he had gone down the same way from where we had returned. It seemed like an impossible proposition to go after that person. Especially more, since Mrugesh was unfamiliar with the streets of Pune and it was getting difficult for me to give directions from the backseat. I called Sankarshan and told him to come over with our car. We sent Mrugesh back to our home and set off to complete the errand by ourselves. Sankarshan and I quickly started to recall the contents that could have gone missing with the bag and the purse. Thankfully, my credit cards were in a small pouch in my pocket and the only thing in the bag was the purse, which contained a good amount of cash, some loyalty cards, food coupons, receipts and an ID card. We decided, that on the way back we would drop by at the nearest police station at Koregaon Park to check if anyone had deposited a lost bag. After we reached our destination, I had to make a few phone calls to locate the person I was scheduled to meet up. After hanging up I noticed a couple of missed call alerts from one number. I called back to check and got through to a gentleman named Yadav. He told me that he had found my bag from the junction and I could collect it from him. Since I had my visiting card in both my bag and my purse, I had been half-heartedly hoping that someone may call back. It seemed too good to be real. I told him, that I would contact him in another 30 mins and meet up with him. After completing our work, we drove back without any further delay and met Mr.Yadav near the State Bank of India at Mundhwa. He handed me back my bag, purse et al. and as a word of advice added that we should have slowed down further when approaching the junction. Apparently, it was his bike that we had collided with. We could not thank him enough for his gesture. He told me that if he had not been able to locate my phone number, he would have indeed dropped my bag off at the police station. We parted after both Sankarshan and I had profusely Thanked him. As I had been suspecting, the top part of the strap (a single strap) had torn and slid off my back. Since the bag and its contents were light, I could not realise its absence. Especially, since I was more absorbed in balancing the gigantic helmet on my head. Although this is not a work related post, I decided to put it through onto the planets. Mr.Yadav reinstated some bit of my faith in the fact that, sometimes the world does still function in the way I have always learnt it to be. It was extremely kind of him to take time out to locate me. Often we see newspaper reports about similar incidents, where the ‘honesty’ of the person returning the valuables is tomtomed. Excuse me, but that is what it should have been in the first place – you find something that does not belong to you, you locate the owner youself or undertake the accepted practice (police/newspaper) to find him/her. In my opinion, media reports of this nature insinuate a ‘natural lack of honesty’ as the norm and anything other than that is a glorified gesture of goodwill. Well, given the times we live in, it may not be an aberration. Personally, I hope and wish that Mr.Yadav also encounters honest people like him in his dealings. Always keep a copy of a photo-id card and a visiting card or any other card with your contact details in your purses and bags. Do not carry all your photo-ID cards with you. Keep something back at home, which you can use to establish your identity if the others are lost and you need to reclaim them. Spread out the money in pockets and purses, so that not all is lost if the purse goes missing. This entry was posted in Personal, planetarium and tagged friends, me, planetarium on May 17, 2010 by runa. Ramkrsna introduced me to the music from Coke Studio a few weeks back. Ever since, I have been finding a new song each day to loop on. Until a couple of days back I was incessently listening to an Afghan song ‘Paimona‘ and ‘Rona Chor Diya‘ both by Zeb and Haniya. This morning I found the most haunting of these songs. Its a poem by Khawaja Ghulam Farid (1845-1901) and sung in the resonant voice of Arieb Azhar. The poem/song is titled ‘Husn E Haqiqi‘ or ‘Beauty of Truth‘. Considering my very little understanding of Urdu, I could not comprehend most of it. Thankfully, an English translation by the singer himself was available. O’ Beauty of Truth, the Eternal Light! The Truth without trace or name. This entry was posted in Personal and tagged friends, music on May 5, 2010 by runa. A wealthy merchant had two beautiful but extremely hot-headed daughters. Due to their wild nature, most of their suitors did not stay long enough and much to the consternation of their father they remained unmarried. Finally, the tired merchant sent out word, that whoever marries his two daughters would be rewarded with palatial houses and showered with luxuries fit for a king. In the same town lived two lazy brothers who were always looking out for easy ways to earn fortunes. They were also aware of the reputation of the two girls, and although they were wary at first eventually they decided to go meet the merchant. As luck would have it, inspite of the announcements the girls had not found any suitors. The merchant welcomed them with open arms and very soon the brothers were married to the two girls. Some time passed. The two brothers lived with their respective wives and had all the luxuries that they could ever dream of. Yet the two brothers seemed to have had widely different fates. While the elder brother struggled to find breathing space and was constantly abused by his wife, the younger brother seemed jovial and at most times was served hand and foot by his rather obedient wife. The elder brother did not fail to notice this. He took his brother aside and asked him how he had managed to ‘control’ his wife. The younger brother then let him on the secret. On the first night of their marriage, the younger brother was resting in his room. Soon, his newly wed bride entered the room and in her characteristic display of rage started throwing things around and abusing him. The husband watched her go about wildly but remained quiet. After some more time had passed and the wife stopped to rest for a while. It was then that the young man looked sternly at his wife, reached for his sword and proceeded towards his wife. Looking at him, the woman froze. He stopped infront of her and in one swoop chopped off the head of his wife’s favourite cat that was resting nearby. The wife was left open-mouthed and shaking. He threw away his sword and went off to sleep. Since that night, his wife had never troubled him any more. Armed with this information, the elder brother went back to his home. As was customary, he was subjected to his daily dose of abuse by his wife at night. Waiting for an opportunity, the man drew his sword and following the course of action taken by his younger brother he grabbed his wife’s cat and killed it. He turned to stare at his wife, expecting her to shake in fear. The woman was horrified at the turn of events. But after a few moments of shocked silence, she jumped at her husband with a huge cry , snatched the sword and drove it straight into him. Much apologies for the violence. This story has been documented for the benefit of a very charming team-mate Kashyap. Last heard he was trying to figure out if implementing some travel plans would cause some disruptions (*imaginary* from what I could understand) of earth-shaking proportions. Really dude, just go for it before you end up regretting a chance lost forever. This entry was posted in Personal and tagged friends, random, story on April 19, 2010 by runa. When I was 10 years old, my family moved from Shillong to Kolkata (then known as Calcutta). As is the norm, my parents went hunting for a suitable school for me and finally decided to put me in M.P.Birla Foundation HS School. Besides the usual criteria like – proximity to residence, good teaching staff, reputed management etc., the other factor that apparently favored in the decision making was that the school would be providing facilities to learn ‘swimming’ and ‘horse-riding’. Unfortunately, the same year was the first year of operation of the school and things took time to sort out. Eventually I passed out after 6 years and the two above mentioned coveted activities never happened. I haven’t visited my Alma mater in a long time and am not sure how things stand at present. Getting me to learn swimming was high on my parents’ list, but given that there were no pools in a radius of 10 kilometers and our individual study/work schedules were grueling the idea was promptly dropped (or rather never brought up again). However, I had it in my balti-list and this year I decided to literally test the water and step in. And for that one needs a swimming dress. I chose a bad day/time to go hunting for one. It was a saturday afternoon and all the sports shops on M.G. Road were closed for siesta. Finally we (I+knowledgeable-crowd-about-swimming-dresses) located one shop that was open and I got myself a military green dress and a rang-birangi vibgyor cap. Next up was getting a membership, so off I was dragged to the gymkhana by pjp to get me enrolled for the swimming classes. All administrative trivia done, next day I land up at the poolside for my big party. Since I am blind beyond 10 centimeters without my glasses, the locker room lady was kind enough to show me to the pool and introduced me to the coach. The first day the coach told me to dunk my head in the water and taught me how to breathe. Thats when I realised that the most common mistake people do while falling into water is that they open their mouth and try to breathe with their nose and as a result they gulp water in all possible wrong ways. I had done that a week back when I had jumped into water at a team outing. Initially I could not hold my breath for too long, but coach was relentless and he made me practise for one long hour. Since it was early-February and I was not used to spending so much time submerged in water, especially late in the evening, I started getting cold. Thankfully coach let me off for the day. Once out of the pool, I was faced with an even greater challenge – to find the way back to the locker room. After a couple of false starts, I managed to end up in the proper locker room. The breathing routine continued for another 2-3 days, by which time I also started to float a bit by hanging onto the railings for dear life. Next up, was gliding. Here I have to mention that the pool is about 4’6” deep and considering my height its a pretty scary depth to be submerged in when one doesn’t know how to keep oneself afloat. Gliding was fun. I had to keep my arms straight, breathe and push myself off into the water to float until my breath gave up. The feeling of floating, was liberating. In whatever little way, I was finally in control of my body. However, I needed more practise and coach packed me off to the smaller pool to do it by myself. Another time another place, maybe I would have been embarrassed at this demotion, but in this case I was actually quite happy for two reasons – I won’t get scared because the depth was less and I could develop and practise a convenient personal spin off technique for a considerably longer period of time, without assistance. Coach kept popping on and off to give me tips about posture, breathing etc. And each day he would fish me out of the smaller pool and make me glide again in the bigger pool. One of the important things I learnt around this time was the technique to get into a standing position unassisted. This boosted my confidence as I now knew how to bring myself back into a safe position whenever I needed to. So the day came when, I started working on a stroke. The breast stroke is the preferred one for beginners here and the first thing one is made to learn is how to move the legs. 1-2-3 the way a tadpole moves. For the next 5-6 days I was put on a glide+tadpole-legs routine. Again I was bundled off to the junior pool for practise practise and then practise some more. Seeing my predicament, one little kid (expert swimmer if I may add) came by and after a closer look at my faltering movement sagely said ‘Aunty, you are moving your back too much‘. In another couple of days, coach handed me a flotation device that would help me learn to lift myself out of the water, breathe and then continue moving forward while maintaining a steady tadpole movement. By this time, I bid goodbye to the junior pool. I was pretty happy floating in and out with this flotation device, until one fine day coach swooshed past me and snatched it away from my hand. He showed me how to disperse water by using an outward movement of the arms and lift myself out of the water to breathe. For two days I struggled to do one complete stroke without faltering. I gulped water everytime I tried and could not keep myself afloat whenever I tried to lift my head out to breathe. I traversed the entire breadth of the pool.. half walking half gliding and struggling all the way. And then one day, I managed to stay afloat for two complete strokes. I was so surprised that I gulped down some more awful tasting water. Coach grinned back at me and I restarted practise. I started swimming the breadth of the pool (~25 mtrs) with a couple of breaks in between. And one day I simply kept going and reached the other end. I had started timing myself and eventually I cut it down by a minute to complete each lap in 2 minutes. Its probably pretty bad by normal standards. Last week, coach graduated me to move onto the length of the pool. The first day was a little scary. Every time I lifted my head out of the water to breath, I saw the long expanse of the water ahead of me. I was trying to figure out how to hold onto my energy levels so that I don’t take too many breaks while completing a lap. Also I ran the added risk of getting cramped in the leg, a problem that had been bothering me a couple of weeks back. On the second day, with each lap the number of breaks came down, from around 4 to 1. Eventually, I completed a full 50 mtr lap! Twice over! The final triumph in that level. I felt like putting out a spot for a McDonald’s celebration ad campaign. Everyday in the pool probably someone completes their own personal goal and no one ever notices in the crowd. Its a source of immense joy and cannot be contained within oneself. Grinning in my head I walked back to office and shared it outright with a couple of folks who I knew would add to the joy with their words of honest encouragement. I had promised myself a blog for the day I completed a pool length lap and this is just that, albeit a day late. I went back to the pool today and ran a total of 10 laps, 5 of which were complete laps done in ~5 minutes each. Before I move onto the advanced coaching next week, I am trying to gain some speed on my current stroke to cut down on the time for each lap. Considering the fact that my mother and father were both pretty good swimmers, I am counting on my genes a bit to help me ahead with this. This entry was posted in Personal and tagged friends, life, me, random on April 7, 2010 by runa.